Antoaneta Maria Gotea was born in July 1972, in Bucharest, Romania. The memories from her early age about her father practicing complicated physical exercises (known in yoga as uddiyana bandha) and unusual breathing (pranayama) synergistically connected with her mother’s teachings about the existence of subtle bodies and reincarnation and this blossomed later in a genuine spiritual aspiration. 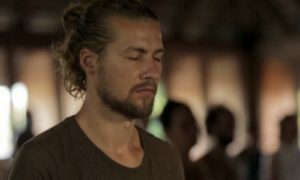 The first encounter with meditation was in 2000 when she joined her partner, Sahajananda, for a meditation retreat in one of the remote caves of the Romanian countryside. The 3 weeks spent in solitude and silence made her understand for the first time how difficult it is to quiet the mind, how much discipline and perseverance one has to have in order to go deeper in meditation, and what determination is needed for the one who aspires to know the Truth. The confrontation with herself was tough but awakening. After this experience, a deep longing for solitude and meditation awoke in her. The next year she joined her partner again in the cave for a second remote meditation retreat. The deep happiness that she felt when she returned to the same cave where the first glimpses of meditation appeared is very hard to describe. Another significant retreat was a kaya kalpa retreat (dark retreat) for 18 days that she did together with Sahajananda. She has continued the meditation path by joining group Hridaya Silent Meditation Retreats led by Sahajananda in Romania, Thailand, and Mexico. 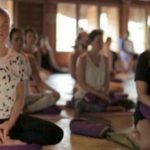 In 2008, she graduated from a yoga teacher training course and started teaching yoga. In 2010 she had the great opportunity to get more in touch with the profoundness of Tibetan Buddhism when she attended the Dalai Lama’s teachings in Bodhgaya, the 10-day Phowa retreat with the great master Ayang Rinpoche and “The Art of Joyful Living” meditation course with Mingyur Rinpoche at Tergar Monastery in Bodhgaya, India. From that moment the Buddhist teachings regarding compassion and bodhicitta have merged with the Hridaya yoga practice based on the non-dual teachings of the great sage of Arunachala, Ramana Maharshi. In 2011, Sahajananda and Antoaneta gave birth to the first Hridaya Teacher Training Course. She had the great opportunity to be the coordinator of the first HTTC and also to teach an amazing group of students/lovers of meditation. And the spiritual journey continues… The meditation retreats continue… Meditation is an on-going transformation of the mind. Until the mind turns completely inward and sinks into its source, which is the Spiritual Heart, such effort is necessary.